Met up with 2 of the people from our tour group who were still around after breakfast and we spent then top. day wandering Winnipeg. 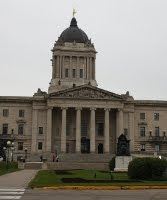 First we went past the Manitoba Legislative Building which has a gold statue of a boy on top. Then we went and spent a good 2 hours in the Manitoba Museum. Then we wandered down along Portage street looking for lunch - which we ended up having Tim Hortons (a Canadian fast food chain). It's not too bad, smaller sandwiches than Subway tho. We ended with a warm drink at Starbucks near the hotel, we were pretty soaked from the constant drizzle! And I bought Varen's last Root Beer at a nearby cafe. I collected my bags from the room and caught a taxi to the airport. My driver was a very amusing Libyan man who was trying to convince me how easy it would be for me to immigrate to Canada ... and then being disappointed cause I have a boyf because he has 2 single sons and also inviting me to his house if I'm ever back in Winnipeg - sorta freaky, really!! And then I started the first of my long airport waits. Winnipeg is not a bustling duty-free area and it's certainly tedious passing the time! Thank goodness I brought an extra book which I have yet to actually even begin!